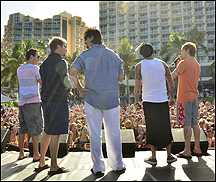 MIAMI (CelebrityAccess MediaWire) — The Backstreet Boys are teaming with with Rose Tours to stage the 20th Anniversary Backstreet Boys Cruise 2013. Setting sail from Miami on October 25th, 2013, the Carnival Cruise Ship Imagination take a three-day trip to the Bahamas and back, with a stop at a private island for a beach party. All five of the recently reunited 'boys' – Nick Carter, Howie Dorough, Brian Littrell, Kevin Richardson and AJ McLean – will be aboard for the cruise. The group performed on August 31st on Good Morning America and is reportedly back in the studio working on their first studio effort together since 2005. The album is on track for a release in Spring 2013.